eSupply Depot offers the complete line of Little Giant Condensate Removal pumps including the VCMA and VCMX Series with medium size collection tank, VCL Series, larger size collection tank the ABS Series for use in shallow pan applications and the EC Series for use in Mini Split System Air Conditioning Systems. 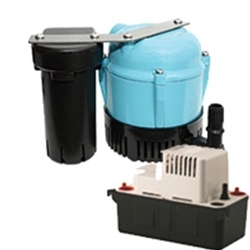 Little Giant has always been the forerunner in the condensate removal pump design and enjoys an estimated 70% market share of the condensate removal pump market. Applications for the Little Giant Condensate Removal pumps include Air conditioning Systems; High Efficiency Gas Furnaces; Beverage Machines; Drinking Fountains; Refrigeration Systems; Furnaces; and Dehumidifiers. The EC-400 is a complete pumping system designed to remove condensation from wall mounted, ceiling and coil split-system air conditioning equipment when gravity drainage is not possible. Compact design allows installation in most split-systems. Components can be placed into the air handler or the pump can be placed up to 3' above the air handler in the ceiling void or inside trunking conduit. A three position symmetrical float sensing system assures reliable ON, OFF and OVERFLOW DETECTION functions. Intake tubing, tube clamps, adhesive tape and vent tubing included. The EC-OP is easily mounted below the air conditioner on the right, left or in the middle. The kit takes up less space than other pumps and includes all components necessary for installation.